Leicestershire Rook Rescue has asked members of the public to be on the lookout for illegally fitted Larsen traps. 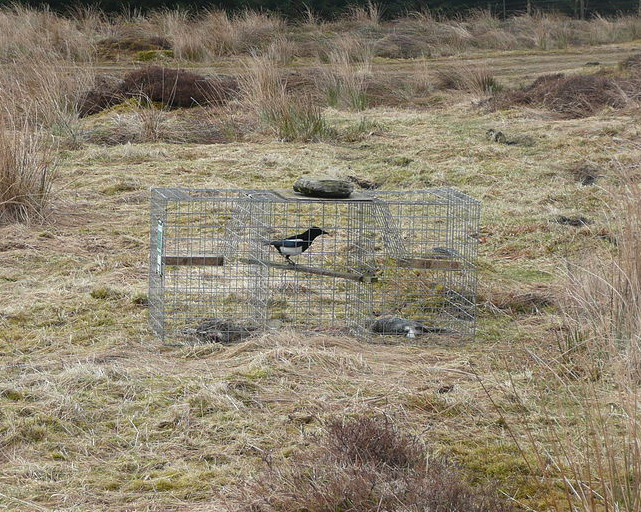 The traps use live corvid decoys – often Carrion Crows or Eurasian Magpies – to lure and then kill others of their kind. They are legal, as long as they are fitted with clean food and water, a perch and shelter from the wind and rain – unfortunately, however, this is rarely the case, rendering many illegal. The mesh snares, known as the 'Box of Death', have one compartment with bait, and another with twigs lying across an open cage. When a bird perches on them they fall into the side cage and become stuck there. A spokesperson for the rook rescue group said: "As wildlife rescuers we need to ensure that the public is made aware of these traps and how they are being misused. They cause a great deal of stress and suffering to the decoy bird and death to those which are captured." Birds can be left in the traps for days with poor quality food and no water (commons.wikimedia.org). The Organisation Against Corvid Traps (ACT) said that there are often no provisions (food or water) left for the 'bait birds', which is an offence under the Animal Welfare Act and the Wildlife and Countryside Act, and explained that the countryside is littered with "disgusting medieval traps that leave birds to die of hunger". The group added: "All too often these birds have been left to die of hunger and thirst and in blazing hot sun. "It is cruel and evil to deny a bird its instinct to mate, nest and hatch eggs at the time of the year when others are doing so. Think of the lonely days and nights it lingers there captive on the ground frightened by marauding creatures of the night." Trappers will sometimes leave only a handful of dried dog food for the captive bird or fix a rodent water bottle to the side of the trap, which is not fit for a bird’s beak. Leicestershire Rook Rescue has worked with the campaign group and signed petitions to have Larsen Traps banned in the UK. A big difficulty, however, is that gamekeepers leave these traps away from public rights of way, rendering them very hard to locate without trespassing.